Robert Dalglish, dated 1897. 2-Storey, gabled Masonic Hall (formerly with shops and public house at ground floor) with crowstepped gable, canted oriel window and decorative doorpiece to W and 2 gabled dormer windows to S. Polished red sandstone ashlar. Base course, string course, eaves course. Principal entrance to S (Queen Street). DESCRIPTION: 2-leaf timber panelled door at left of S elevation in pilastered, pointed-arch architrave; circular window with Star of David glazing pattern above all recessed within hoodmoulded round arch. Small aediculed window with round pediment at 1st floor to centre. Crowstepped gable to right with timber-panelled door and former shop windows at ground (partially walled up); large mullioned oriel window corbelled out above with quatrefoil carving to base; datestone to gable apex. Former shop windows (partially walled up) and door to ground of S elevation; 2 large mullioned dormered windows breaking eaves above with roll-moulded pointed-arch margins and shouldered gableheads. Plate glass in timber sash and case windows to upper floor; predominantly non-traditional glazing to ground. Ashlar-coped skews. Corniced gablehead stacks. Iron ridge vents. Non-traditional late 20th century tiles to roof. Cast-iron rainwater goods with plain hoppers. INTERIOR: predominantly remodelled and modernised in late 20th century. Trussed ceiling to Masonic Lodge (covered by false ceiling). 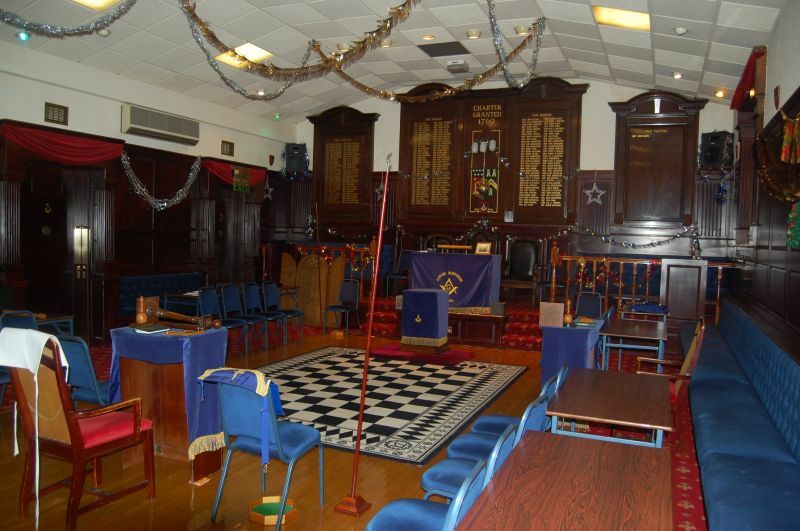 Built as a Masonic Lodge with shops and a public house on the ground floor. The building is now in single ownership. A well-detailed red sandstone building occupying a prominent position on the junction of Queen Street and King Street. Robert Dalglish (circa 1839-98) was the assistant to, and later in partnership with George Penrose Kennedy. His early work, for example Callander Free Church, was mostly in western Perthshire, but he later built up his practice around Glasgow. In 1876 he built the extension to Rutherglen Town Hall in partnership with John Thomson. This Masonic Hall was built within the last year of his life and was probably one of his last commissions. Dalglish's surname is more commonly spelt 'Dalgleish', but he seems to have used both spellings, and 'Dalglish' is used on the Dean of Guild register for this building. It is interesting to note that the petitioner who submitted the Dean of Guild application for this building was a women, Mrs Gardeners.